"Metamorphosis" prints usually consist of folding flaps, each printed with part of a design and which, when opened sequentially, show several consecutive scenes. This example is an imaginary view of the hanging of Confederate president Jefferson Davis. (Davis was actually only imprisoned.) For another of the many popular portrayals of Davis's hanging, see "John Brown Exhibiting His Hangman" (no. 1865-16). 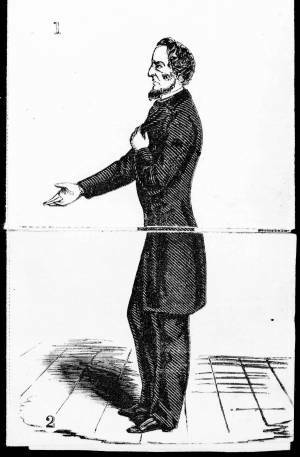 In the first scene, Davis holds one hand to his chest and his other hand out, asking pardon. Next, Davis sits weeping on his coffin, a noose around his neck. In the final scene he hangs, his face hooded, from the gallows as crows (or vultures) fly overhead.